It seems like there are new mattress companies appearing every week, especially online. While it’s great customers have an abundance of brands to choose from, it makes shopping for the best king size mattress an overwhelming task. Considering that you spend roughly a third of your days on your mattress, it’s not a decision you should make lightly. If you’re searching for a king size bed, you have many mattresses to choose from, and many factors to consider. In this guide, we’ll discuss everything you need to know when buying a new bed. How Big is a King Size Mattress? Who Should Get a King Mattress? What Are the Best King Beds? A king size mattress is 76 inches wide and 80 inches long. A king bed is 16 inches wider than a queen bed, but king and queen beds are the same lengths. A California King bed differs from the standard King in the fact that it’s skinnier and longer, having dimensions of 72 inches wide and 84 inches long. A California King is a great option for taller individuals. A king bed is the same length, and twice the width of a Twin XL bed, which is 38 inches wide and 80 inches long. Because a Twin XL bed is exactly half of a king bed, many mattress brands sell what is called a Split-King bed. A Split-King mattress is two Twin XL mattresses placed side by side to equal the dimensions of a standard King. By using two Twin XL mattresses together, instead of one solid King mattress, it allows couples to have different mattress types on either side of the bed. For example, if one partner prefers a soft bed, while the other partner prefers a firm bed, they would be able to buy a Split-King and choose which mattress type to have for their side of the bed. What About the California King? During your search for the best king bed, you may have come across the California King option. A California king bed is 72 inches wide and 84 inches long. This means it is longer and slimmer than a traditional king. Several decades ago, different parts of the country were using different standards for bed sizes. The bedding industry eventually agreed on national standards for bed sizes, but the California king remained popular. This is why you still see the California king on the market today, albeit with less frequency than the standard king size. Should you get a king size bed or a California king? That depends on your needs. California kings are better suited for tall sleepers. It’s also good for long, narrow rooms that would better accommodate a slimmer bed. Getting a king mattress is something to consider when shopping for the best mattress for couples because a king mattress gives you the most space. While a queen usually works just fine for both individuals and couples, a king is the most popular mattress size for couples. Before committing to a king size bed, make sure it can fit in your home. This includes measuring the space in the room where it will go, and also the hallways, stairs, and entryways in your home. You don’t want to purchase a large bed and then find it does not fit in your bedroom. What Is the Bed Made Of? The materials used to make the mattress has a huge effect on your sleeping experience. A coil mattress will sleep differently than a memory foam mattress, while an innerspring mattress has a different consistency than a latex mattress. Even within those different mattress types, there are many distinctions. Gel memory foam versus high-density memory foam, for example, or Dunlop latex vs Talalay latex. Beyond comfort, support, and body temperature, these materials are also manufactured in different ways. If it’s important for you to support eco-friendly means of production, make sure you research the environmental impact of each type of mattress. Look for mattresses made with plant-based materials if you want a “green” mattress. If possible, look into when the company was founded and how long it’s been selling mattresses. While there isn’t necessarily a direct correlation in terms of years in business and quality of the mattress, it can tell you a few things. The longer a company has been in business, the more time it’s had to hone and refine its customer service skills. It has also had time to incorporate customer feedback into new designs, new products, and revised products. Chances are, an older company has a more efficient manufacturing and delivering process in comparison to companies that have only been in business for a year or two. Check the “About Us” page on a brand’s website or browse their social media profile to see when they began. The battle to offer the best online mattress is in full swing. More and more customers are choosing to save money by buying directly from a mattress company instead of through a third party retailer such as a furniture store. Customers are doing this not just because the mattresses are often fairly-priced, but because they come with generous and customer-friendly sleep trials. When it comes to online mattress brands, they typically have very few locations around the country, if any. Meaning, you’re most likely not going to get a chance to try out the mattress physically before you buy it online. 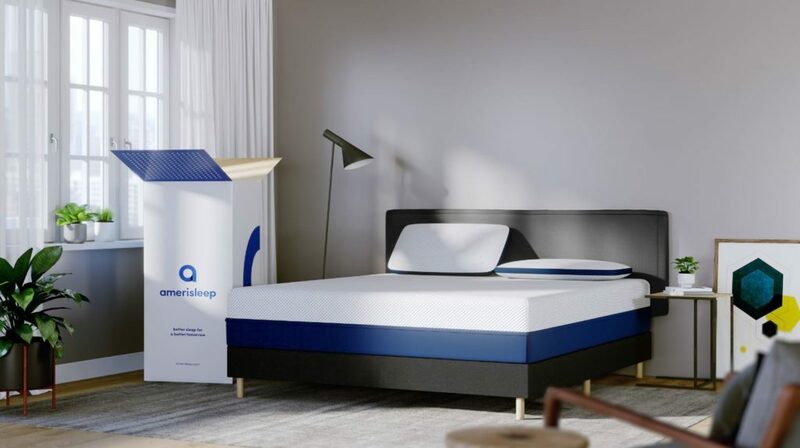 As to not scare customers away, many companies will offer a lengthy trial period to try the mattress in your home and decide if the mattress is for you. Generally, this period is between 90-120 days. Before you buy, read the fine print included with the information regarding the trial period. While some mattress companies will offer free returns if you decide to return their mattress, other companies will charge restocking fees or fees to ship it back to them, even during their “free” trial period. Many mattresses tend to sag in the middle over time— some more than others. Check to see if this type of wear and tear is covered in the mattress’ warranty. Additionally, check out other mattress reviews to see if other customers have reported deterioration in their mattress. NOTE: Many mattress retailers only honor the warranty if you buy it directly from them. In some cases, if you purchase the mattress through a mattress store or online outlets like Amazon or eBay, your warranty will not be honored. Many online mattress reviews are filled with horror stories about the company refusing to honor the warranty due to it not being purchased directly from them. Before you buy from a third party seller, ensure you’ll still be eligible for the warranty. What Is the Firmness Level? Your sleeping position. If you sleep on your stomach, you will likely need a firm mattress. Want the best mattress for side sleepers? Look for a medium-soft to medium mattress, while back sleepers do well with soft to medium-firm mattresses. Your body type. The larger you are, the better a firmer mattress may suit you. The best mattress for heavy people will be a mattress that is supportive, often thicker than the average mattress, and will be made with durable coils or high-density foam. Your mattress preference. Depending on your preference for a firmer or softer bed, may determine whether or not you’re choosing a medium or a medium-firm mattress. If you prefer a softer bed, it’s important to find one that’ll be soft enough to meet your preferences, but not too soft that it causes you to sink in the bed. If you prefer firmer mattresses, find one that offers support but isn’t so firm that it causes pressure points. When reading reviews of mattresses, pay attention to the height and weight of the reviewer to see if that review is relevant to you. Do You Have Any Special Sleep Needs? If you suffer from sleep problems such as sleep paralysis or sleep apnea, make sure you consult with your doctor about which kind of mattress is right for you so you can get a healthy night’s sleep. Before buying, read customer reviews to get a more genuine idea of a brand’s products and customer service. Look at a selection of the five-star reviews, but more importantly, look at the one-star reviews. If they point out that the medium mattress was too firm, take that into account when making your decision. You may see reviews mention the mattress is degrading after only a few years, or immediately sagging soon after purchase. They may also mention “off-gassing”, a common complaint with online mattresses where the mattress has a strong chemical-like odor that can last for weeks, and possibly months, after the unboxing. If customers mention a brand’s customer service team refused to honor their warranty or failed to honor a discount, consider doing business with a different company. Always take reviews with a grain of salt, as there are always two sides to every situation. When you’re reading reviews, take note of the number of reviews a company has. A company with a three-star reputation and 15,000 reviews may be more credible and reputable than a five-star brand with 15 reviews. Also, consider also how long the reviewer had the mattress. If a review mentions discomfort, and they state they’ve only had the mattress for a few days, it may not be the most telling review of the mattress because it can take several weeks, and sometimes months, to adjust to a new mattress. RELATED: Should I Get a Queen or King Mattress? 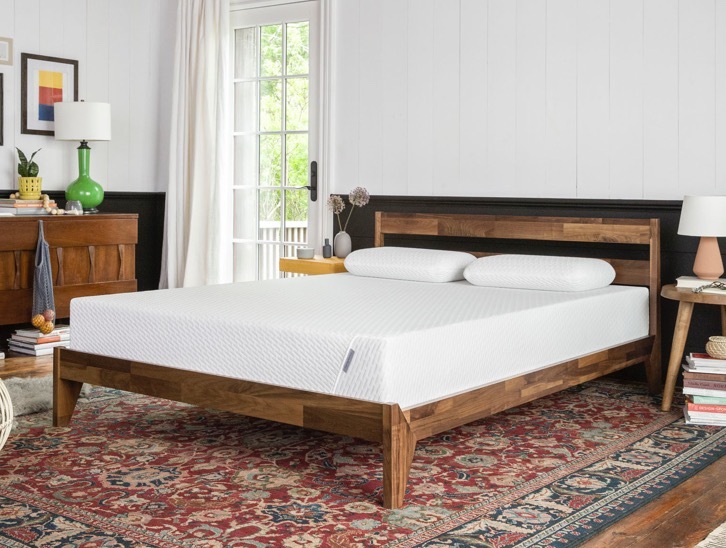 In this next section, we’ll take a detailed look at some of the biggest online mattress brands, discussing the mattresses they carry and reviews they receive. At the end, we’ll touch on our recommendation for the best king mattress. 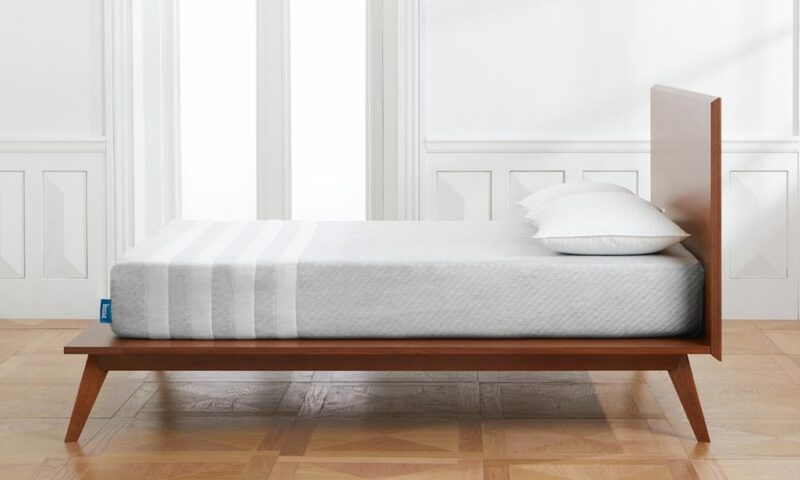 Tuft & Needle® is a fairly recent mattress startup, having shown up on the market just a few years ago. It’s made an impressive debut with a very popular mattress, made from their own unique Adaptive® foam. The Tuft & Needle® king size mattress has two layers: a comfort layer of poly foam at the top and a high-density poly foam layer at the base. At 93 pounds, the Tuft & Needle® king mattress is an average weight. It’s also a fair price, at $750. The signature Tuft & Needle® mattress only has one firmness level, which may not be to everyone’s liking. Some of the reviews say it’s too firm, while others say it’s not supportive enough— making it hard to gauge whether it’s the right fit for everyone. Some shoppers may prefer brands offering more firmness options. 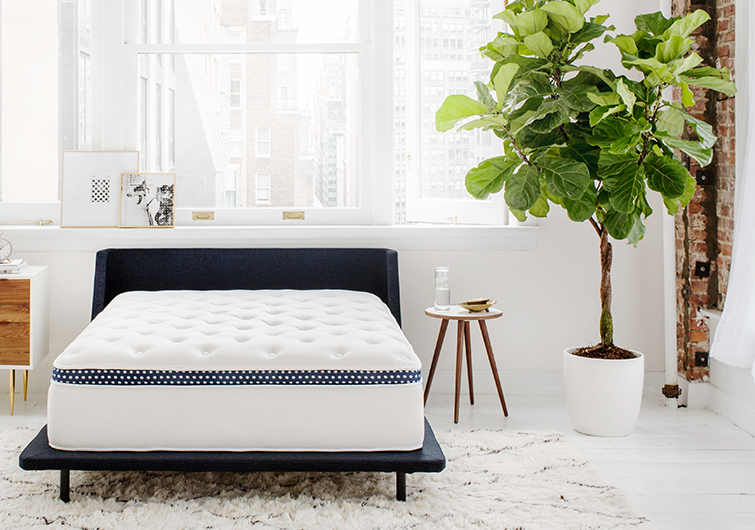 Recently, Tuft & Needle® did release a new mattress, the Mint. The Mint is two inches thicker, a little more expensive, and aimed towards those who want a softer sleeping experience. Tuft & Needle® offers a 100-night trial for customers, during which they can return the mattress if it’s not a good fit. It also offers a 10-year limited warranty, during which Tuft & Needle® will repair or replace the defective product. It excludes wear and tear or using the mattress in a manner it’s not designed to, such as not using a recommended base. A new company, Purple® came about in 2016 from the creators of Floam back in the 1990s. They wanted to take the comfort of stretchy hyper-elastic polymer and adapt it to fit mattresses. The original Purple® mattress uses its own hyper-elastic polymer Smart Comfort Grid™ in its top layer to promote airflow and eliminate pressure points. The middle and base layers are polyurethane foam. These internal layers are purple, as the name suggests. The Purple® king size bed costs $1,299, which is fairly average when it comes to king size mattress costs. You get a 100-night trial period, free shipping, and a 10-year warranty. Some reviews mention that the unique structure of the Purple® mattress provides strong motion isolation, which is an important feature to look for in king size mattresses, especially for couples. Many reviews claim that it felt great to sleep on at first; but, as time went on, some people found the layers of their mattress falling apart. Some customers also reported pain in their back and pressure points. Other reviewers mention that the mattress is hard to move and rearrange. At 140 pounds, it is heavier than the average mattress. 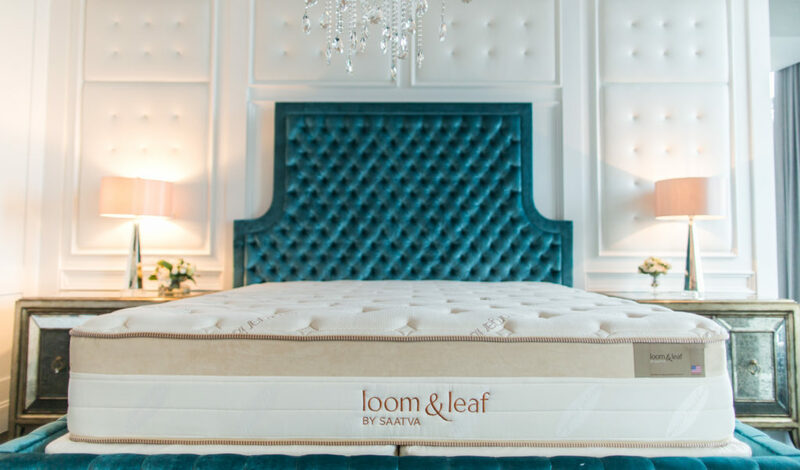 The Saatva company owns Loom & Leaf™, a memory foam mattress. A quilted cover tops the Loom & Leaf™, along with elements of foam and natural thistle to protect against fire damage. The comfort foam layer underneath is a 2’’ layer of gel memory foam. The gel helps alleviate some of the overheating that is common with some memory foam mattresses. The core is a 2.5’’ visco-elastic layer of memory foam, followed by a 2’’ transition pad and a 5.5’’ high-density foam support layer. Loom & Leaf™ gives you two firmness options: Relaxed Firm (its “flagship comfort level”) and Firm for those who need extra support. Loom & Leaf™ offers a 15-year warranty and a 120-day trial period, both of which are longer than the typical periods offered by other mattress sellers. However, there is a drawback. If you choose to return the mattress during the 120-night trial period, you will be responsible for paying a $99 shipping fee. Some reviews also mention that the edge support could be stronger. When you sit or sleep near the edge of the bed, you might feel like you’re about to roll off the side. At $1,699, the Loom & Leaf™ is on the higher end of the price scale. Helix was founded in 2015. It is primarily an online retailer as it has just one showroom in Manhattan, New York. 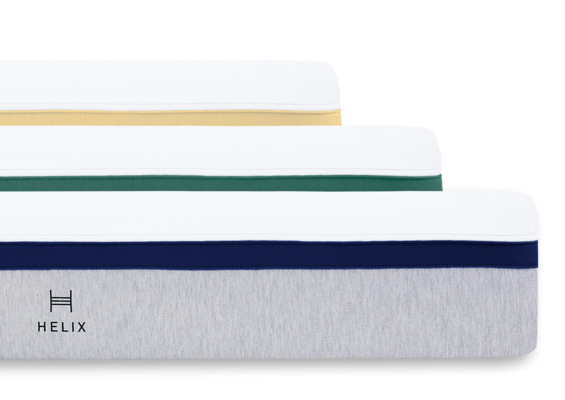 Helix offers hybrid mattresses made from memory foam, latex foam, and using a system of pocketed coil support cores for pressure relief and support. 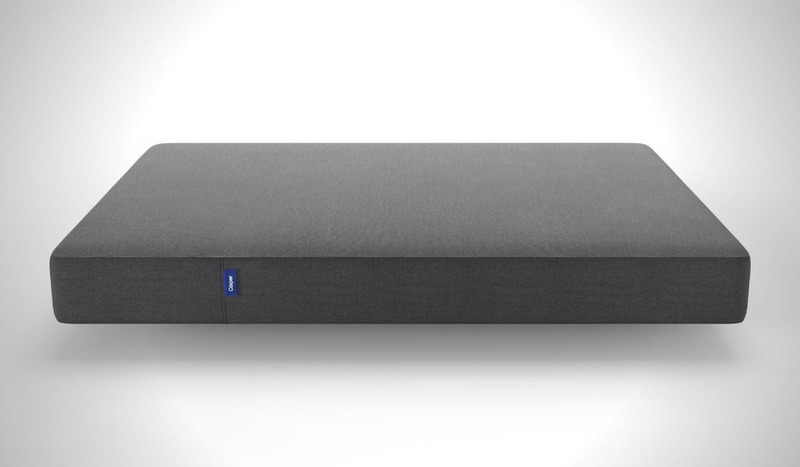 Helix asks its users to take a “sleep quiz” so it can best match a mattress with the sleeper. Helix offers several models: Sunset, Moonlight, Midnight, Dusk, Twilight, Dawn, Nightfall, Dual Balanced, and Dual Extra. Each of those models has a corresponding “Luxe” counterpoint with extra layers. The Dual Balanced and Dual Extra have different types of firmness on each side, which would make them solid choices for couples with different sleeping preferences. The pocketed coil system is also good for couples as they provide strong motion isolation. The cost for the king sized mattresses ranges from $1,245 for the standard versions to $2,095 for the luxe versions. Helix offers a 100-night trial period, and you can return the mattress for a full refund after trying the bed for a minimum of 30 days. The standard Helix mattresses have a 10-year limited warranty, and the Luxe models have a 15-year limited warranty. Amerisleep is an American mattress company that was founded in 2007. It sells mattresses directly to customers online, and it has nine physical locations in Arizona, Colorado, Oregon, and Texas. It specializes in memory foam mattresses with several unique touches. Amerisleep has five main models: AS1, AS2, AS3, AS4, and AS5. The AS1 is the firmest and AS5 the softest. This variety helps provide a mattress for anyone, no matter your size or sleeping preference. The Bio-Pur® memory foam found in Amerisleep mattresses has a unique open cell structure. While some sleepers complain that memory foam mattresses are too hot, Amerisleep has solved that problem by creating a memory foam material that is five times more breathable than traditional memory foam. Bio-Pur® contains plant-based materials, and it is made through an eco-friendly manufacturing process. 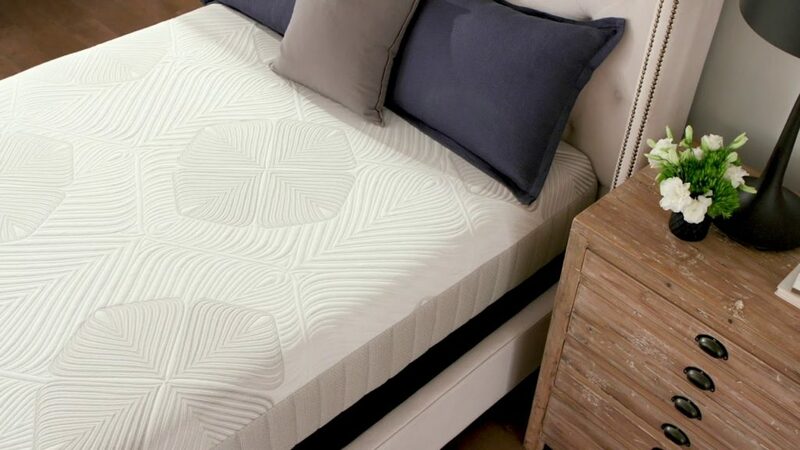 Another unique feature of the Amerisleep mattress is the Celliant® top layer. Celliant® has been FDA-determined to recycle natural body heat into infrared energy. Infrared energy promotes local blood flow, which in turn, regulates your body temperature. The Celliant® fabric in the cover helps to regulate your temperature while you sleep, promoting a more restful night’s sleep. The Amerisleep AS5 model also offers an Active Flex layer for extra pressure relief, making it a great option for heavier individuals. The AS2, AS3, AS4, and AS5 models contain a layer of HIVE® (Harnessing Intelligent Ventilation and Energy) technology. HIVE® offers zoned-support throughout the mattresses, with stronger support in the neck and lower back region and more comfort in the shoulders and hips. The mix of these layers and materials creates a healthy and comfortable sleeping environment, especially on the king size mattress. Amerisleep often runs promos discounting their mattresses. For more accurate pricing, check out their website to see if they’re running any discounts. While the cost may seem excessive for some, they offer a 20-year warranty and reviews indicate that the mattress keeps its shape well over time. Meaning, it could be a great investment into your night’s sleep. During the first 10 years of your warranty, if your mattress is found defective, Amerisleep will replace it for you 100% free of charge. After the first 10 years, if your mattress is found defective, Amerisleep will issue you a new one at a 50% discount. Their warranty is longer than many offered by the competition. Additionally, Amerisleep offers a 100-night sleep trial, free shipping, and free returns. Leesa keeps things simple with one model, the Leesa Mattress. It’s made of three types of foam to provide support, body-contouring and a cooling effect. It is available online or at select West Elm locations. It has a two-inch cooling foam on top made of Avena®, a material similar to latex. Beneath that is a two-inch layer of contouring memory foam, followed by a six-inch core support foam base. For some sleepers, this bed offers enough support, but many customers have complained about a lack of support and that the mattress is too stiff. Others customer reviews mention the bed sleeps hot and has a strong chemical off-gassing scent, often lasting for weeks after opening the bed. It is described as a medium-firm mattress. Several reviews complain about the strong off-gassing odor, sometimes taking several months to fade away. The king size Leesa mattress costs $1,195. Leesa offers a 100-night trial period, and it also offers a 10-year warranty. Some reviewers mention that the return process is not as easy as advertised and that lumps started forming on the mattress within a few months. Kingsdown is the oldest mattress company on the list. It was founded in 1904 and offers several options for king-size mattresses. One of their most popular mattresses is called the Miro, it’s a memory foam mattress. The top layer is made of gel-infused memory foam, which helps to keep you cool at night. Under the comfort layer is a layer of Serene® foam, which uses independent air cells for extra cooling and pressure relief. The support layer is made of a double layer of foam coal. It also has a layer of high-density foam that wraps around the support foam layer. The goal of these is to increase air circulation inside the mattress. Since the Kingsdown Miro is only available at retail stores, it is up to the individual sellers to decide what the trial period will be. While it does have the advantage of being available to try out in more stores before you buy, it doesn’t give you in-home trial experience. An in-store test run is usually not as effective in determining if the bed is right for you as sleep trials are. Additionally, the third party retailer will probably hike up the price; you’re more likely to pay more for a mattress from a mattress retailer than you would be buying one directly from the manufacturer. The website conveniently offers a tool for finding Kingsdown mattress retailers near you. The Kingsdown Miro comes with a 10-year limited warranty. It can cost anywhere from $1,699 to $3,999, depending on where you buy it. While the Miro is good at relieving pressure, we found it’s not the best mattress for heavy stomach and side sleepers. Casper mattresses have been an option since 2014. They carry three mattress models: the Wave, the Casper, and the Essential. The Wave is their most deluxe option. It has five layers, with indentations under the shoulders in the bottom layer to allow for extra give and more spinal alignment. It also uses open-cell foam to increase breathability. The top layer is Flo Foam, followed by a layer of latex for extra bounce. The third layer is memory foam for pressure relief that contours to your body. Below, lies a transition layer made of high resiliency foam, and the mattress is anchored by contoured support foam. As you can imagine, their most luxurious model is a bit pricey, with a king Wave costing $2,750. Another option from Casper is their mid-grade model, the Casper. The Casper has four layers compared to the Wave’s five. It is more affordable at $1,195 for a king bed, which weighs 91 pounds. The top layer is breathable open cell latex foam to keep you cool and add bounce and support. The second layer is high-density memory foam for contouring, and the third layer uses two different densities of foam to support your hips and shoulders, called Zoned Support. The foundation layer is dense polyurethane foam for extra support and durability. For those looking for a more affordable option, you can choose the Casper Essential. The essential has three layers, and it is the thinnest of the three. It starts with an open cell top foam layer, followed by a responsive memory foam layer. The bottom layer is made of extra-firm foam for added durability. The king-sized Essential is very lightweight at just 76 pounds and is the most affordable option at $725. Casper offers a 100-night trial period and a 10-year limited warranty. It also offers free shipping and in-home setup. A newer company, Winkbeds started selling mattresses in 2015. Winkbeds markets itself as the “first handmaid luxury hybrid mattress.” Its main distinguishing feature is the coolControl™ system. Similar to heated seats in cars, coolControl™ lets you control the temperature of the bed via an app and a physical air conditioning unit attached to the bed. The coolControl™ feature is popular among couples with different sleep temperature preferences. Some negative reviews mention motion transfer within the bed is an issue. 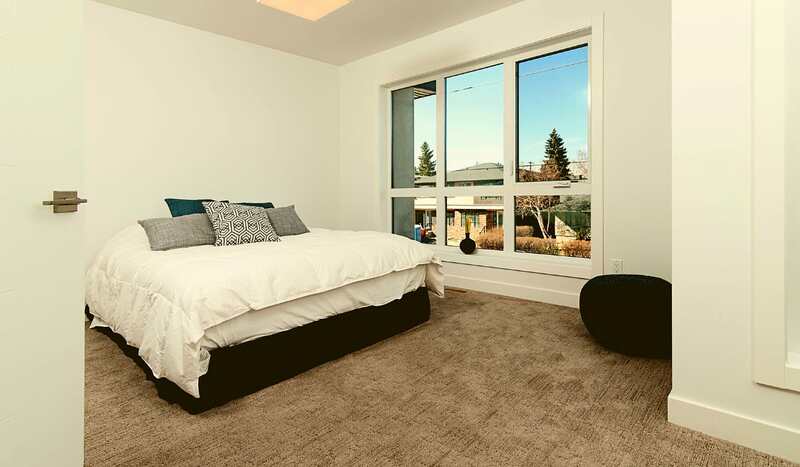 A lack of motion isolation could cause an issue for couples, especially for those who share their bed with someone who tends to toss and turn when they sleep. As for the mattress itself, it is a 6-layer hybrid of spring and foam. It has a layer of gel-infused Hypersoft foam followed by a layer of Premium Gel foam. Next, it has an air spring coil layer encased in foam. Below is their LumbarLayer, a pocketed coil system individually wrapped and encased in high-density poly foam. Winkbeds offers one type of mattress of variable size and firmness: Softer, Luxury Firm, Firmer, and Plus. The Softer, Luxury Firm and Firmer king beds are $1,299, and the Plus is $1,499. Winkbeds offers a 120-night trial and a full replacement lifetime warranty, the latter of which is extremely rare. All in all, we recommend Amerisleep’s AS3 king size mattress. The motion isolation is fantastic, and it offers a good night’s sleep to the widest variety of shoppers. With five different firmness options, it has something for everyone. It has the perfect mix of support and cushioning where you need it. The best king size mattresses are structurally sound, quiet, isolate motion, and likely to last. 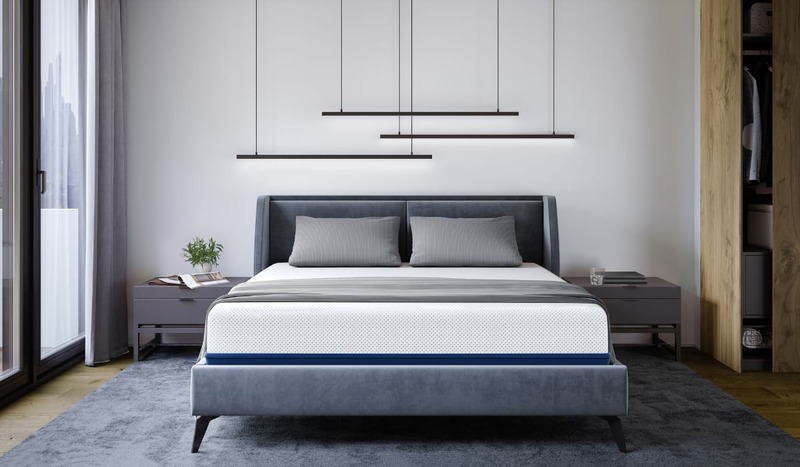 Amerisleep designs their mattresses to provide exceptional pressure relief and support, while still feeling plush and comfortable to the sleeper. We hope this guide will help you pick out the best mattress for you. When choosing your next mattress, consider your sleep needs and mattress preferences to find the best king size mattress for yourself.